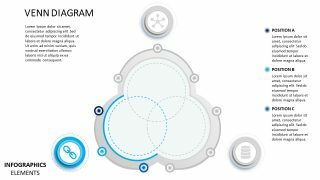 The Venn Diagram Material Design PowerPoint Diagram shows a fantastic cycle design. It shows the three overlapping stages and the clipart icons to represent them. The Venn diagram PowerPoint gives sci-fi effect through the set of flat infographics. 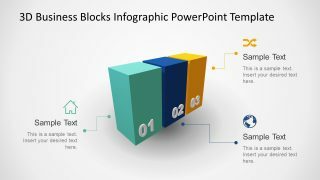 It is a 3 step PowerPoint diagram where the first slide provides the overview of the concept. Whereas, the next three slides focus on one segment each by discoloring the other two. The material design is an impressive way to display the complex Venn diagram relationships. Further, the diagram assists in providing a more visibility to the abstract ideas. 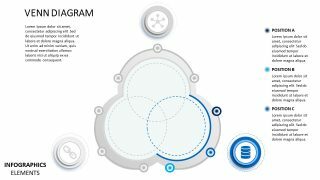 Such diagrams are the brainstorming tools for business as well as the educational purposes. 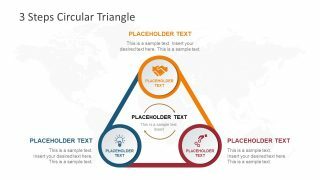 The Venn Diagram Material Design PowerPoint Diagram provides the text placeholders for all three segments. These enable users to enter the relevant textual content, important notes, and information about each overlapping circle. 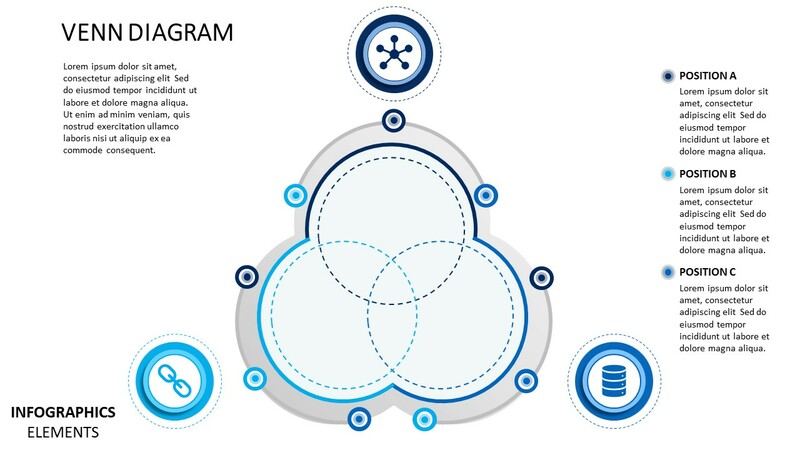 In the material design PowerPoint of Venn diagram, the infographic elements represent each of the three stages. 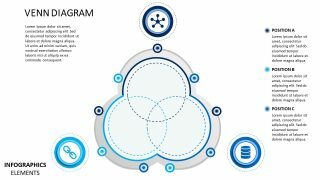 Such as the five-pointed star shape, chain link, and database icon. It can describe the continuous cycle of workflow as a sequence of tasks or events. The presentation of the Venn Diagram in material design is suitable to discuss the relationship between any three objects. Take three basic constraints of project management for an example, the time, cost and scope. 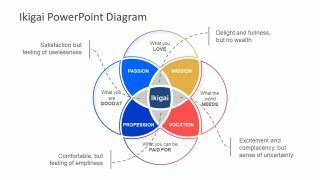 The place where all three components overlap each other is the point of quality. Because it is the point where the best use of time, money and scope is applied. 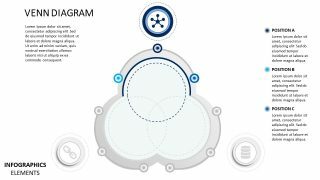 The Venn Diagram Material Design PowerPoint Diagram is a flat vector template of 4 slides. 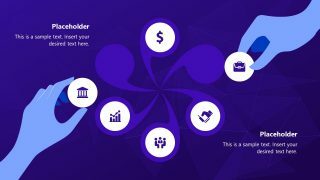 The shapes and icons are editable Venn diagram, enabling users to customize and personalize the design. For instance, change the blue and white theme of a template by either going into the variants-colors option. Or, manually change the layout from the shape fill and format background option.